Our Bakery is one of the most beloved places in the community. 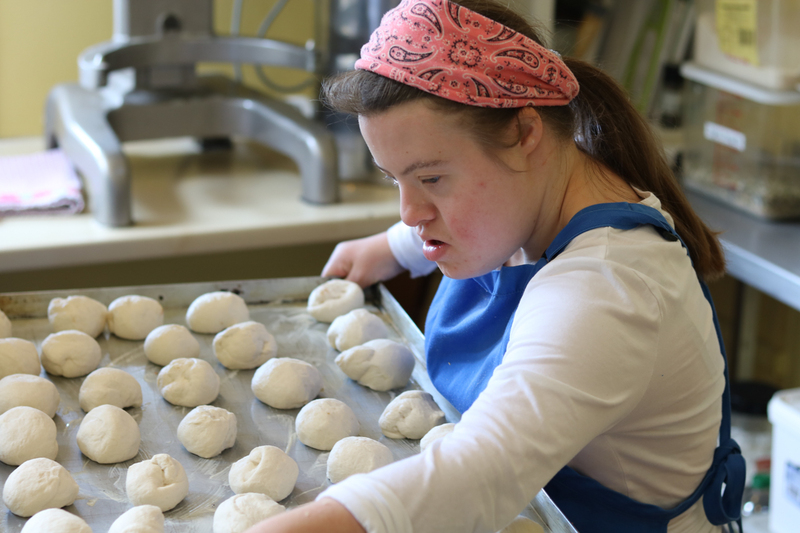 Up to 12 bakers do meaningful work throughout the day to make a selection of breads – including different kinds of sourdough and regular loaves –, rolls, cookies, granola and the famous pizza to attend the exigent taste buds of our residents. Baking can be therapeutic in different ways. It can makes us all feel happy and helps lift spirits. The feel of the flour, the sound of the blender, and of course the smell of the delectable final product – all these experiences can stimulate the senses, which in turn increases our feel-good endorphins. Festivals like Michaelmas, Christmas and Easter give us the inspiration to make specialities and to try something different. We are famous for our Harvest loaf and Advent biscuits! The Learners’ Café is a new impulse in our Community. This came about with the Occupational Studies (an accredited qualification) for some of our residents in baking and hospitality skills. We later saw that we needed a base for which they could use their new skills, hence ‘The Learners’ Café’. The pop-up Café happens once a month at the Clanabogan Bakery. Our residents bake the homemade goodies, serve the customers and - of course the not so nice work - do the washing up! The Learners' Café project adopts a 'learning by doing' approach to help our residents to gain experience in the baking and hospitality industry. Our menu is a typical tea room Café theme... organic teas and coffee, scones, tray bakes, cake, bruschetta etc. We pride ourselves on our friendly welcome and cosy atmosphere. Keep an eye on our Facebook page for the next monthly café date. My name is Steven. I have been working at Camphill Community Clanabogan for almost 10 years - although it doesn’t feel it!! My role here is Day Opportunities Team Leader/ Bakery Workshop Coordinator. Also, between my main roles, I am working as a FR and PR facilitator. Yes, as you see I’m a Jack of all trades! I guess one of the unique elements of Camphill Clanabogan is that I get a taste of a variety of work roles and how the community works. Most recently, I have qualified in a diploma level 5 in Leadership in Health and Social Care which comes in useful with my job roles at present. “10 years” I hear you say… I believe that true motivation comes from achievement, personal development, job satisfaction, and recognition which Camphill have provided me over these years. Here’s to the next 10! !